The Lynx are still mired in a bit of a rough patch after losing to the Sparks on Sunday. Now they have a few days off before a potential revenge game against the Mystics in D.C. There were some interesting tidbits in Sunday’s game—a bit of lineup reshuffling, some changes to minute distribution—but I want to avoid the trap of making assumptions based on just one outing, so we’ll address the team’s play again in next week’s column. For this week though, let’s take a look at some things happening around the rest of the WNBA: it’s shaping up to be a great season. The Connecticut Sun (5-0) are the only remaining undefeated team in the WNBA, but what’s more interesting than their record is how they’re winning their games. The Sun don’t have a single player on their team who ranks in the top 20 in the WNBA in scoring. In a 12-team league, that’s pretty remarkable, and it’s even more remarkable that they’re still getting good results. What the Sun do have is balance. They have six players on their team who average double figures—four of their starters plus backup guard Alex Bently and backup forward Jonquel Jones. Bently actually leads the Sun in scoring with 14.2 points per game. Unsurprisingly, the Sun lead the league in assists with 22.4 per game. They also play excellent defense, holding opponents to 38.9 percent from the field so far this season. Both of these numbers speak to a high level of communication. While it is possible to score in isolation, it’s impossible to play defense on an island—to contain opposing attacks, players need to know where their teammates are and what they’re going to do before they do it. They need to know each other’s tendencies, when and where to help, and they need to be bought into the defensive scheme. To average 22.4 assists is impressive as well. To put that number in perspective, the Sun have assisted on 60.4 percent of their baskets this year. Put those two numbers together, and the Sun have averaged 97.4 points per game, and allowed their opposition 74.4. That’s insane. Those numbers will probably even out a bit once the Sun cool down and the season progresses, but they’re definitely a team to watch. One of the things that makes Connecticut so good (and this should make sense to Lynx fans) is familiarity. The Sun’s core group has been together since 2016 and have improved each year. The Sun’s hot start is not the result of new players coming in and providing talent that was missing, it’s due to the same group of players getting to know each other, and each making individual improvements in order to help the team win. Does this story remind you of anyone? Thought so. This is the team-building model the Lynx have been employing since 2011. They know that the talent on their roster is there, and each offseason the trick is to let the core gel while finding the right combination of players to put around them. 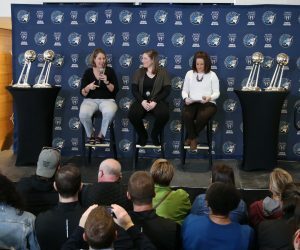 While the Lynx have players on their roster that can take over a game, they have prioritized playing team-first basketball, and the rest of the league has noticed. When a team finds success at the level that the Lynx have, it changes the way the rest of the league thinks about the work of roster construction. The Lynx are in Connecticut to face the Sun on Saturday, you won’t want to miss it. The Mystics have played more games (eight) than any other team in the WNBA so far, so it’s been a trial by fire for Atkins. Even without much time to get used to the league and practice with her new teammates, she has excelled. Atkins has started in three games for the Mystics and played in a reserve role in the other five, and is averaging 12.5 points per game on 42.4 percent shooting from the field, and a solid 39.5 percent from three. She’ll need to work on getting her overall percentages up, but it is a great sign that she’s doing so well from deep in her first season. The Sky had a down season last year, but the play of their third-overall draft selection has to have them feeling optimistic. DeShields, a 6-1 guard who played college ball at Tennessee, has been a starter in every game for the Sky, and has all the makings of being a productive player for years to come. Though DeShields has been having trouble getting her three-point shot to fall so far, her handle and inside touch have been every bit as good as advertised. She’s averaging 15.3 points per game, second on the team only to Allie Quigley. DeShields has also shown her ability to be an excellent rebounder in the backcourt, averaging 5.2 boards per game. Kelsey Mitchell’s best ability is a very basic one—she can put the ball in the hoop. She averages 18.3 points per game to lead the Fever in scoring. She’s also shooting 43.5 percent from three! Holy smokes that’s good. There are other players who shoot a better percentage from deep, but none of them have attempted anywhere close to Mitchell’s 46 shots from beyond the arc. Only Phoenix star and WNBA legend Diana Taurasi has made more threes this season. If Mitchell can keep this production up she has a very good chance at leading the league in made threes not only this year but for many years to come. The next step for Mitchell is developing more of an ability facilitate, but leading a WNBA team in scoring as a rookie is no easy task. She has a long career ahead of her. When the Lynx play the Fever, they better get a hand in her face. Of all the players on this list, Nurse is the only one that looks like a draft-day steal in the traditional sense of the word. Mitchell and DeShields will both be stars in the league, but they were top-three picks—it’s expected that they have the ability to come in and shoulder the load for their clubs. Nurse on the other hand was taken with the 10th-overall pick, and came into a locker room that had already established a winning culture, and boasted a legitimate superstar in Tina Charles. Nurse could have deferred to her veteran teammates and taken a backseat, but she has done just the opposite. Coming off the Liberty bench, Nurse is averaging 19.0 points per game to go along with 4.3 rebounds and 2.5 assists. She broke New York’s franchise record for points by a rookie and points by a reserve in a 34-point performance against the Fever in the Liberty’s opening game. She’s here to play. Speaking of Las Vegas, last week the Aces picked up their first-ever win, 85-73 over the Mystics at the Mandalay Bay Events Center. While the Lynx are in competition with the Aces, so it feels weird to be cheering for them, it’s important for the league that Las Vegas finds success. The Aces were relocated from San Antonio (where they were the Stars) before the beginning of this season. They are one of only three teams in the WNBA that do not share a market with an NBA franchise, and they join the growing ranks of Las Vegas pro sports. Their cross-town NHL team is currently playing in the Stanley Cup, and while the Aces might not be competing for a championship this year, they have an opportunity to capitalize on a fan base that is very excited about their city finally getting some professional sports teams. A star like Wilson only helps that endeavor. She’s an exciting young player who just delivered the franchise its first win. There’s plenty of space in Las Vegas for pro teams to carve out a spot, and thanks to Wilson the Aces are well-positioned to do just that. However, the best way for a team to gain a following is for it to win. Wilson may be a superstar, but she’s going to need a little more help. The Aces are now just 1-5 on the season and are struggling to put the pieces together behind Wilson. Their biggest issue seems to be a lack of shooting, they shoot an awful 27.6 percent from beyond the arc, and attempt fewer threes than any other team in the league. However, the rest of their numbers are fairly solid. They’re in the middle of the pack in field goal percentage, and their defense is good if not great. The Aces are probably better than their record—don’t be surprised if they rattle off a few wins. Taurasi is truly incredible, and the league is lucky to have her. Now, back to planning on how to shut her down the next time the Lynx play Phoenix. That’s just a small snapshot of what’s happening in a truly entertaining WNBA season. What you really need to do is get WNBA League Pass and watch more games. It’s fun to follow along with the rest of the league, and it’ll help you stay informed when you’re rooting for Minnesota. 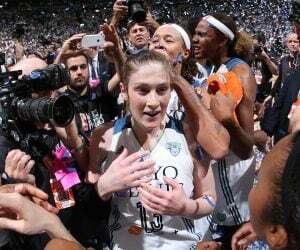 Now, let’s get back to your Lynx with a few quotes and highlights from the week. 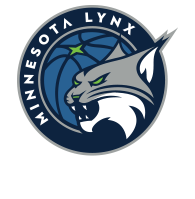 This week’s highlight was a nifty bit of ball movement in the Lynx’s game against the Mercury. This is just textbook beautiful team basketball. Maya Moore’s great ball handling gets it all started, then Tanisha Wright (who had a phenomenal game against Phoenix) has the awareness to pass up a potentially contested look and find Maya on the cut out from the paint. The Lynx routinely turn in a few plays like this every game that are just such a joy to watch. Commitment. It’s been a rough week for your Lynx. Every time something seems to work out, another problem crops up. But it’s still early in the season. I wrote last week that I wasn’t panicking (and why you shouldn’t either), and I’m sticking to that statement. The key for the Lynx is staying committed to their game plans even when things aren’t going their way. You have to think that sooner or later the Lynx will catch a break, but if they stop playing their game when they fall behind that’s an issue. The Lynx are not a run and gun team (though with Danielle Robinson at the point they’ve been getting up the floor way faster), and their defense is more focused on getting stops than forcing turnovers. Their style necessitates that the Lynx be patient when things aren’t going their way—we’ve seen this team go on runs, but they do so by sticking to the way they play best, not by changing their identity. “Nothing just happens. Just because you’ve done something in the past, gives you zero guarantee it’s going to happen again and that’s life. That’s what we’re experiencing and that’s what a new season is all about. 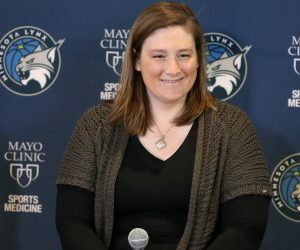 You know, we have this group right now, in this league, in this moment and all those little things that we make look so easy over the years are really hard and we’re going to have to continue to fight and work and figure out what it looks like for this group right now to get it consistent, which will convert to wins.” –Maya Moore on the Lynx’s early-season struggles. “They all centered around the idea of knowing what our identity is and how we do things. My message to them at the end there was remembering, we don’t allow easy entry passes, we don’t let people into the paint easy, we’re difficult to play against, we try to deflect passes, and then offensively, taking care of the ball. Especially end of quarters, end of games, we’re putting ourselves in a little bit more of a difficult situation than we need to be.” –Coach Cheryl Reeve on her points of emphasis in practice. “It felt really good to work hard in here today and just get after it a little. We needed it. 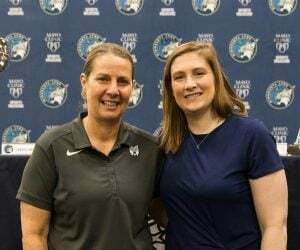 With the schedule, the way it plays out this year, the times we do have practice it’s going to be really important, and it’s on us as veterans to come in and work hard and set the tone in these practices.” –Lindsay Whalen on finally getting a practice in during the team’s road stretch. “We’ve been in good places three out of the four games. We were right there in the fourth quarter and lost on some buzzer beaters, so we’re doing the right things we just need to make sure we’re paying attention extra in those moments.” –Sylvia Fowles on late-game execution. The Lynx are in D.C. Wednesday and Thursday to do a few community events and play the Mystics on Thursday afternoon. A heads up, if you had put that game on your calendar, the tipoff time was changed earlier this week. It’s now at 3 p.m. After they play Washington, the Lynx head up the coast to take on the league-leading Sun on Saturday. It’s been a road-heavy start to the season, with limited time for practices, but it gets easier as soon as next week, when Minnesota has almost an entire week off before playing the Liberty at home next Saturday. We’ll have content throughout next week as the team gets a few practices in, and another edition of this column next Tuesday. Thanks for reading and see you next week!